There was another hero there that morning with Eustacia Cutler. He was sitting two seats over from me. A man, slightly balding, sitting quietly just like the rest of us. I was so engrossed in Mrs. Cutler’s words that I didn’t even notice him. Until he stood up to speak during the Q&A session. He raised his hand and was given the microphone. His voice shook a little. He introduced himself as a 55 year old man with a brother with autism. His brother is non-verbal. He wants help and advice from Mrs. Cutler on how to reach him. Or, more directly, can he still be reached? “Of course,” replies Mrs. Cutler. She’s trying to feel him out more, get more information on what he means and how he connects now with his brother. I let out all the air I had been holding in. My friend Jess touches my shoulder. She knows. This is too much. The sibling thing. The balance. The feeling like you’re sacrificing one child’s needs for another. Not knowing what is right or wrong but just hoping you’re doing the right thing. She said that autism needs to be viewed as a family issue. That all the family members need counseling on the disorder. Too often, she said, the siblings become helpers. “Children should be children,” she said. And here was this man – this 55 year old man – still coping with trying to figure it all out. 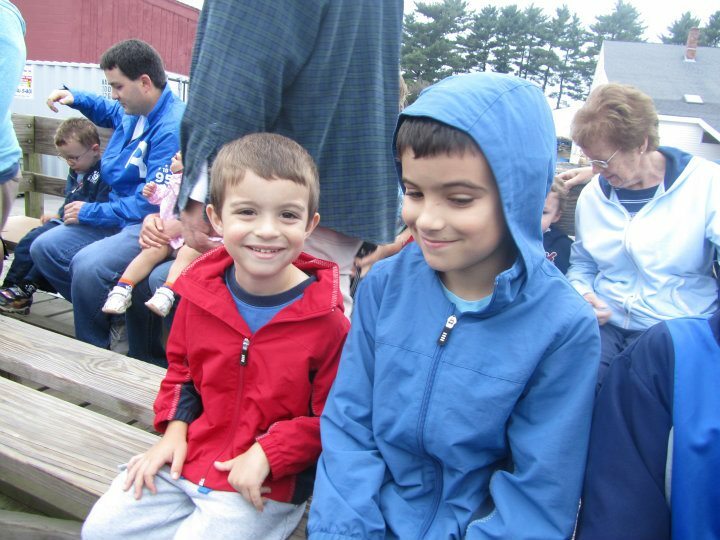 After fifty-five years, autism was still an family issue. I knew I had to talk with him. After getting my book signed, I went up to the man. “I think that’s wonderful. It’s great that they get to be with their uncle.” I was smiling. My eyes were teary. I gulped. Swallowing the tears. I shook his hand and said good-bye. I turned back to Jess and tried to breathe. That night, Gerry came over to the dinner table and slumped into his chair. I looked over and there were two Lego building sets on the floor. Howie had opened all his birthday presents and was playing with them one by one. This is the classic difference between my two boys. Howie opens one at a time, and perseverates on that one toy. Then…moves on. Gerry needs to open them all and put everything together immediately. He couldn’t stand the fact that the Lego set had been sitting there all day. He slunk off, back up to the safe haven of his room. The man that I met that morning had his connection. After all these years, he found his way back to his brother. They were bonding over their love of restaurants, connecting without even knowing it was happening. He’s a hero. A man who went against everything he knew and forged a path back to the brother he loved. Unconditionally. I know someday my boys will be heroes too. I don’t need them to be anything more that just brothers. We throw the word hero around a lot. Athletes are “heroic” when they lead their team to victory in the Superbowl. Actors give “heroic performances” when playing an edgy role on film. And yes, to many, they are heroes. But for me, my hero is someone who has stood up against those who fought to tear them down. Who do things that people say can’t be done, not for their own glory but for the sole purpose of helping another. A hero, for me, is someone who takes the world on, holds that world on their shoulders, and carries the burden so that the rest of us can move freely. I met such a person on Saturday. Her name is Eustacia Cutler. Temple Grandin’s mother. I sat in the room with about a hundred other people. I settled in to my seat next to my friend Jess. I balanced my coffee, muffin and notepaper on my lap. My eyes welled up then and never stopped. For two hours, this incredible eighty-five year old woman captivated the entire crowd. I hung on her every word. I can’t read my notes. I was scribbling so fast trying to keep up with everything she said that I can’t read my own writing. I have snippets of phrases like “Autism is a buzz word, but no one knows what the buzz is about”, meaning that the world out there knows the word autism, but they don’t understand how to interact with our children. I wrote “She keeps saying “our children’. I am truly having trouble processing all that she said. But she did talk about one thing that, for me, “cuts close to the bone”. Theodore Morrison, who knew Frost well, said that Frost also came late to lecturing and was never entirely at ease with it. The thorn, Mrs. Cutler said, represented identity. A way of remembering who she is as a person, not just as Temple Grandin’s mother. She said that “autism helped me learn. But it was not enough.” She was an actress, a singer, a journalist, and now a highly sought after lecturer. She rejected every convention at the time and forged her own path, knowing that the only way to help her children become fulfilled was for her to feel full too. She needed her own identity. So while her daughter’s autism was woven through the things she did, it wasn’t only about her daughter. She did research for a local PBS station on autism, but she was the journalist. She sang for veterans from the Korean War who were permanently injured, trying to pull the smiles back out of them. She was – is – an autism mom…plus. I have spent a lot of time recently thinking about what I want to do now. As in the “you’re-in-this-next-stage-of-your-life-so-what-will-you-do” sort of way. I had been looking at it as something that had to be separate – something not autism-related. What Mrs. Cutler showed me is that you don’t need to escape the autism to find a piece of yourself. You can embrace what you’ve learned from your child’s autism and then make it a part of what you do for you. Like my friend did with her Lego club. Or like what my friend is doing with her tennis camp. I can take what I know about autism and sensory processing disorder and create my own passion from it. It started with my son. But now it can be about so much more. 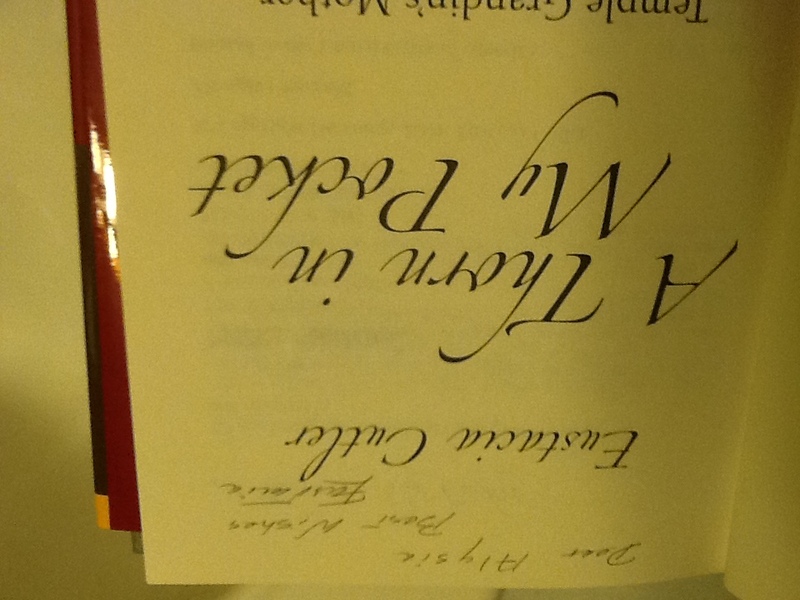 When Mrs. Cutler’s talk was over, many of us stood in line to get our books signed by her. As I waited, I rehearsed in my head what I wanted to say. I wanted to tell her she was my hero, but not in an overly fawning sort of way. I wanted to tell her about my boys and how amazing they are and how they take care of each other. And how they make me laugh and cry. I wanted her to know about The Oxygen Mask Project – that we were trying to help parents find that “thorn” in their pocket. A way to remind parents that they need to take care of themselves in order to be there for their children. More than anything, I wanted to keep my composure. Do not cry. When it was my turn, I got down on my knee and started gushing. She looked at my name tag so she could spell my name right. And I continued talking. Mrs. Cutler looked right at me. And with that, the tears started to fall again. There were people there that day who have written about that morning much more eloquently than I can. So when you can, please read HERE. And HERE. I have one more post in me about this life changing day. I hope I can get the words out.